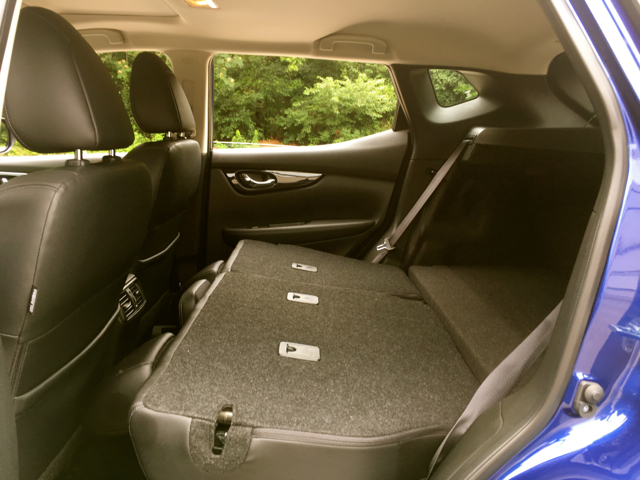 Straddling the space between subcompact and compact SUV. At first glance, the Nissan Rogue Sport looks a lot like its namesake. The Nissan Rogue Sport is an all-new model or at least it is new to North America. 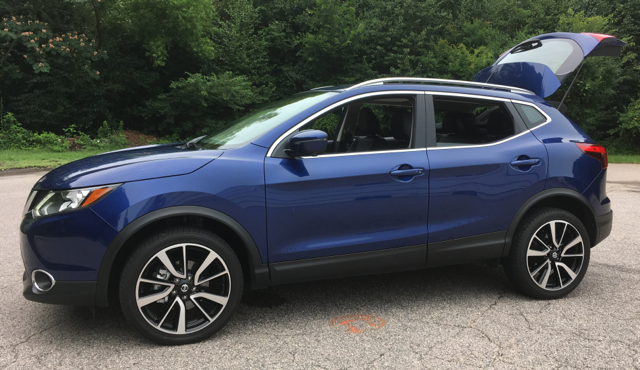 Not to confuse it with the Nissan Rogue, the Rogue Sport is smaller than the compact Rogue, yet larger than the tiny Juke. Thus, it fills the imaginary “white space” between the two models, supplying an attractive entry for Nissan in the small SUV sector. 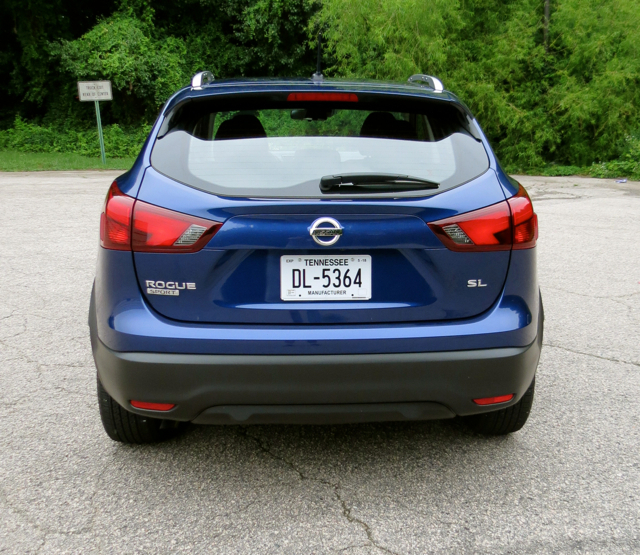 While new to North America, the Rogue Sport has long been available as the Qashqai in Europe. Pronounced “cash-ky,” Nissan probably worried certain wrong pronouncements would follow, thus the fresh nomenclature. Then again, the Volkswagen Tiguan (Tig-wahn) has caught on, even if it certain pronouncing errors persist. By calling the new model the Rogue Sport, Nissan also harnesses a best-selling product’s name. Moreover, the two models share the same underpinnings, although the Rogue Sport measures about a foot shorter. 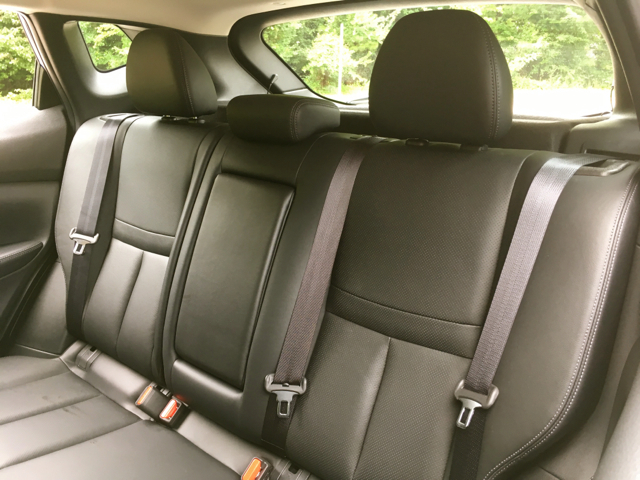 This means interior space in the Rogue Sport is smaller, affecting rear seat space, yet still larger than the Juke and its almost impossible second-row seat. 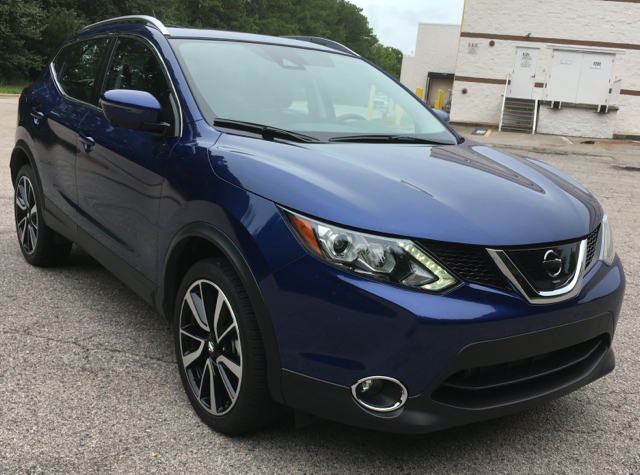 The 2017 Nissan Rogue Sport comes in three grades: S ($21,420), SV ($23,030), and SL ($26,070). Add $960 for the destination fee. Choose all-wheel drive and your base price increases by $1,350. Package options include a $570 appearance package on the S grade, adding 17-inch aluminum alloy wheels set within all-season tires. The SV grade offers two packages — all-weather ($920) and premium ($1,500). The all-weather package adds fog lights, heated outside mirrors, remote engine start, a heated leather-wrapped steering wheel, heated front seats and a leather-wrapped shift knob. The premium package adds voice recognition navigation with NissanConnect services, Sirius traffic and travel link, a seven-inch color touchscreen, an around view monitor, moving object detection and blind spot warning. Choose the SL grade and you’ll have access to a pair of packages as well. A premium package ($2,280) brings in LED headlights, high beam assist, a power-sliding moonroof, blind spot warning, forward collision braking, and rear cross-traffic alert. The platinum package ($570) raises the safety quotient by one notch, adding intelligent cruise control, forward emergency braking with pedestrian detection, lane departure warning, and lane departure prevention. 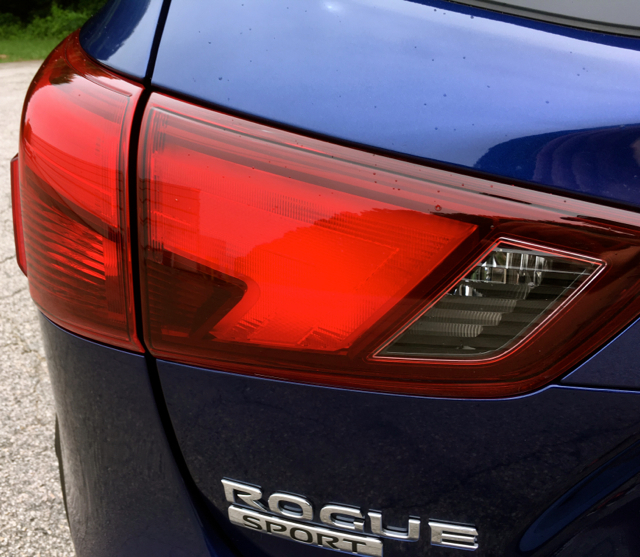 At first glance, you’ll be hard-pressed to tell the difference between the Rogue Sport and the Rogue. Positioned parallel and those differences begin to sharpen — at least from a footprint perspective. 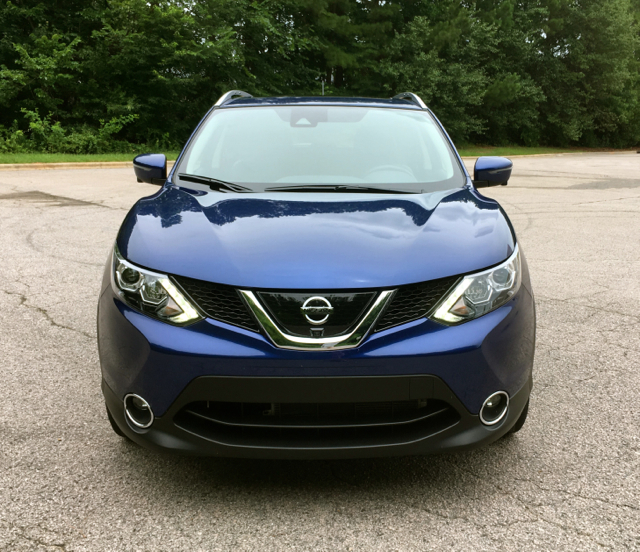 The 2017 Rogue Sport features a strong front fascia accented by Nissan’s trademark V-Motion grille hemmed in by headlamps with LED accent lighting. 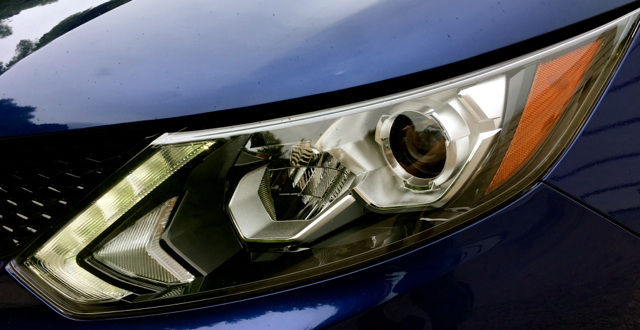 The lower grille opening is larger than the top and is offset by available fog lights. This SUV’s profile has an even beltline that suddenly begins rising just forward of the rear door handles. Numerous character lines, body sculpting and available rocker panel trim convey polish. At the rear, you’ll find the familiar wing-shaped taillights, a custom-designed spoiler, and a single exhaust port tip. Standard 16-inch steel wheels give way to 17- or 19-inch aluminum-alloy wheels elsewhere. Optional equipment includes automatic headlights, power outside heated mirrors with LED turn signal indicators, roof rails, and fog lights. 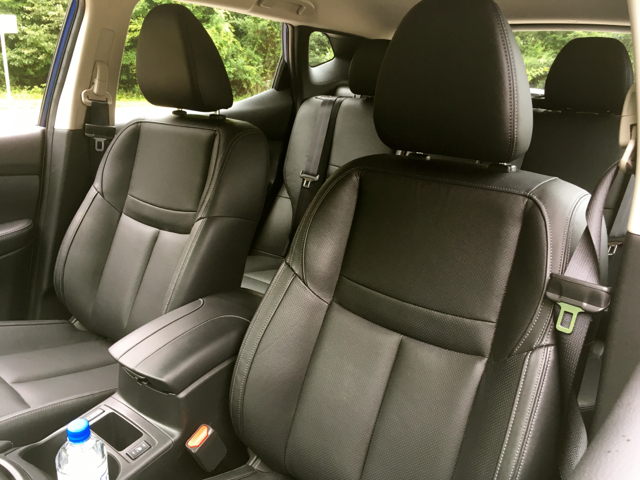 The 2017 Rogue Sport offers room for five with a 60:40 split fold-down bench seat behind the front bucket seats. Cloth seats come standard, but leather covers the SL’s seats, which also have heating and cooling functions. A manually operated driver’s seat gives way to six-way power-adjustable seats in the other trims, including lumbar support. The front seats are comfortable, offering sufficient support to the back, thighs and legs. 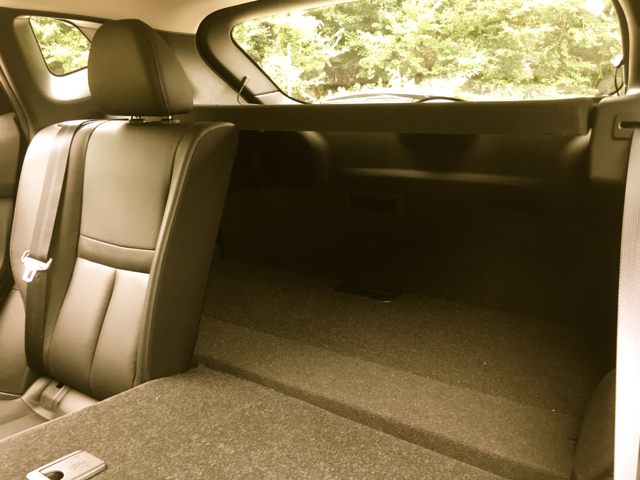 Pity any tall person who sits in the back, unless the front driver and passenger are small and accommodating — legroom is tight as is the hip room. If you’re shopping the Rogue Sport for your family, a pair of pre-teen youngsters should find the space fine. But, three across seating is a bit much. That said, most families with four people should shop the Rogue instead. Credit Nissan with delivering a simple, but useful center console. At the top of the console are the climate system vents, followed by the color screen with switches and knobs on both sides. Beneath that is the climate control system with a smartphone-sized open pocket at the base along with the connection points. The transmission stick splits the front seats. As for the instrument panel you’ll find a pair of analog displays with a digital driver readout in the middle. The displays are easy to read in all lighting conditions. All models have keyless entry, power windows and door locks, a manual tilt steering wheel, cruise control, air conditioning, two map lights, four cup holders, four drink holders, and a front seat center console. 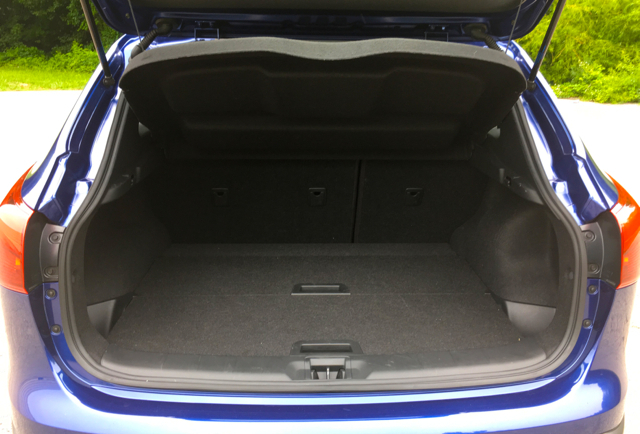 The storage compartment has a removable cargo cover, and four floor-mounted and two side-mounted tie down hooks. Available features include remote engine start and dual-zone climate control. On the safety front, the 2017 Rogue Sport comes with a suite of airbags, stability control, traction control, and anti-lock brakes. Safety ratings are pending from both the National Highway Traffic Safety Administration (NHTSA) and the Insurance Institute for Highway Safety (IIHS). Available driver assist features include rear cross-traffic alert, lane departure warning, lane keep assist, adaptive cruise control, and forward emergency braking. Most come with the top grade, found in the platinum and premium packages. 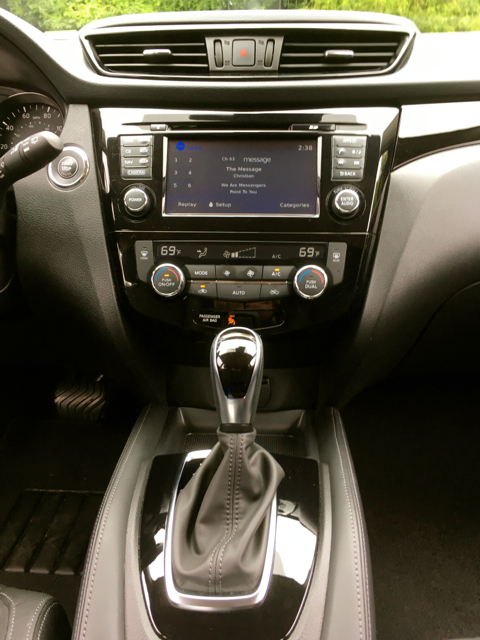 All models have a USB outlet, an auxiliary audio port, satellite radio, and Bluetooth smartphone connectivity. The base model offers a four-speaker audio system with a five-inch display, the SV comes with a six-speaker system, while the SL has a seven-inch touchscreen display and satellite radio. The two top trims have Siri Eyes Free. Every 2017 Rogue Sport comes outfitted with a 2.0-liter four-cylinder engine with 141 horsepower and 147 pound-feet of torque. Paired with a continuously variable automatic transmission, this SUV makes 25 mpg in the city and 32 mpg on the highway (front-wheel drive) or 24/30 mpg city/highway all-wheel drive. 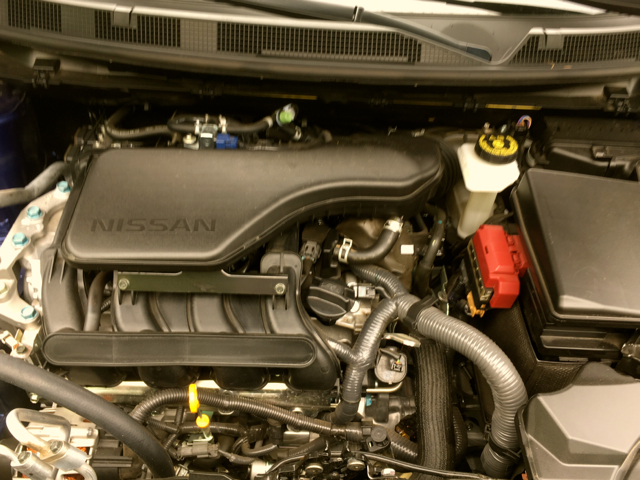 This same powertrain moves other Nissan models, including the NV200 van and the Rogue Hybrid. 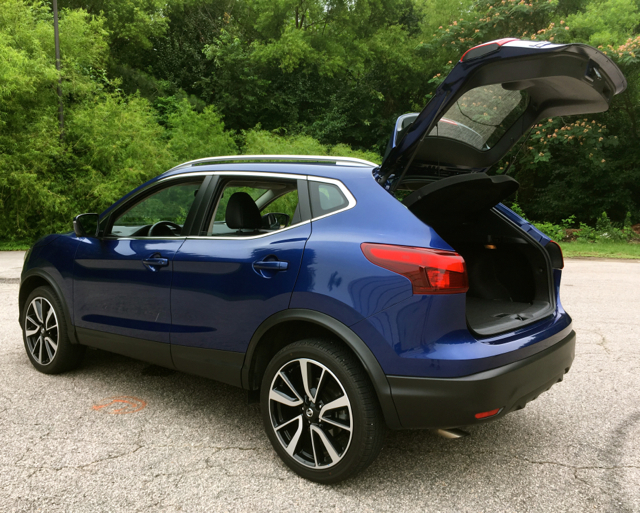 The 2017 Rogue Sport gets the job done and that’s a sufficient bar for most shoppers. My family of four, including myself, made a 160-mile round-trip excursion with this SUV one Sunday and rarely did I want for more power. Hard acceleration, however, shows its weakness as passing power comes slowly, but steadily. The Rogue Sport manages bumps just fine or at least it is in the same company as other small models. Steering is light to the touch, while the Sport’s small footprint comes in handy in the all-important turning tight turning radius category. The Rogue Sport is an attractive and relatively low-cost option to today’s small SUVs. If you’re a fan of Nissan, you understand its placement between the Juke and Rogue. Priced slightly higher than the smallest SUV, but not by much, the Rogue Sport is big on value. Unless you live in snow country, all-wheel drive is not necessary. Begin your search with the SV and add the all-weather and premium packages, and your total is $26,400. Through incentives and careful negotiation, you should find one for about $25,000, an attractive price point for this vehicle.